2019 is a big milestone year for OSGi Alliance as we celebrate our 20th anniversary! We’re proud to have accomplished so much in those 20 years and look forward to marking many more milestones in creating open specifications that enable the modular assembly of software, and the use of highly performant microservices, built with Java technology. The road has not always been smooth but any bumps have served to help our organization refine its focus, approach and ultimately our offering to the market. We are marking two decades of growth and have provided a significant influence as a global consortium creating open specifications that enable Java modularity and microservices. Over the last 20 years, we have been productive in introducing well-adopted technologies including the Whiteboard Pattern, dynamic dependency injection with Declarative Services, Configuration Admin and Remote Services. For more details on our milestones over the last 20 years, read our full press release here. OSGi Alliance will also be commemorating its 20-year anniversary with a celebration reception at the 2019 OSGi Community Event so stay tuned for more details and save the date for October 21-24 in Ludwigsburg, Germany! Belated New Year Wishes to all in the OSGi Community. We hope you had a good festive break and no doubt are settled in for the year ahead. We are pleased to announce the first OSGi event of 2019. Join us on Tues 19 Feb in Berlin, Germany. The OSGi Alliance is holding its Expert Group meetings in town that week and we are pleased to have secured some interesting talks covering OSGi and Java 9 and beyond, Realtime OSGi and the edge, and also a look at a number of popular patterns to use with OSGi. Thanks to the Berlin Brandenburg JUG for their support in arranging this event, also to the OSGi Users' Forum Germany and to Bosch for hosting us and providing refreshments. This Berlin Brandenburg JUG event is being supported by the OSGi Users’ Forum Germany and Bosch. The meeting will be held at the Bosch IoT Campus in Berlin and doors open at 18.30 for a beer and some networking in advance of the 19.00hrs start of the talks. Registration is essential so we know numbers for the drinks and pizza kindly provided by our hosts Bosch. Further details on the talks and presenters are provided below. Java 9 introduced the Java Platform Module System (JPMS) as a way to modularize the Java platform and it can be also be used by developers to modularize their own applications, although JPMS lack a number of important features for software running on the Java platform. As people look to support the latest versions of the Java platform, changes introduced in Java 9 related to JPMS led to the needs for some features in the OSGi Core specification. OSGi framework implementations like Eclipse Equinox and Apache Felix and tools like Bnd were updated to support these new features. BJ Hargrave is CTO of the OSGi Alliance and chair of the OSGi Core Platform Expert Group. His day job is as Senior Technical Staff Member in the IBM Digital Business Group. BJ has led the development of OSGi technology since its inception and is a committer on the Eclipse Equinox project and the Bndtools project. the basis for filling this gap. It provides both APIs and JVM semantic refinements for realtime programming and resource management. Marrying these features to OSGi will make OSGi the leading platform for edge computing. Related Technology Supplement now published as DO-332 and ED-217. He joined the OSGi Alliance to bring realtime to OSGi. We will look at common cloud and design patterns and see how the special properties of the OSGi environment allow us to rethink these patterns. The talk shows some well-known patterns like the service registry and the whiteboard but also some unique patterns like out of band circuit breaker or graceful degregation. The patterns are shown with some examples using declarative services(DS). So some basic OSGi and DS knowledge is of advantage but not required. For OSGi beginners, the well established OSGi patterns will help getting started the right way. Experienced OSGi developers will find some new patterns to think about. Cloud or enterprise developers will get a new approach to some patterns they are used to which hopefully inspires them to take another look at the current state of OSGi. Christian is a computer scientist working at Adobe on the Adobe Experience Manager Platform team. On the open source side he is involved with quite a few Apache open source projects like Felix, Karaf, CXF, Camel. Christian is interested in clean code, software architecture and modular software design. We hope you can join us in Berlin next month. If you have any questions please contact us by email. who joined us and also to the speakers who provided the talks (and lots of pre-event hard work preparing them) that are essential to the success of the conference. This year we learnt how OSGi is being used by ESA for tracking and controlling spacecraft, we discovered how virtual reality can be used to understand the dependencies within OSGi software, we had an insight on using Node-RED with OSGi, and we also learnt how OSGi is being used to build Open Liberty and the benefits that it brings to a large codebase like this. BJ Hargrave, OSGi Alliance CTO also provided an overview of what has been added to OSGi R7 and Bnd to help navigate Java 9+ and JPMS. There were also several looks in to the future of how OSGi can be used with Docker and Kubernetes and how OSGi fits with MicroProfile. Thanks also to our hosts, EclipseCon Europe, who we were pleased to co-locate with again this year in Ludwigsburg. The social events and networking opportunities were in abundance again and appeared to be thoroughly enjoyed by the OSGi and Eclipse communities. The slides and videos from the talks at this years event are now available and you can find these by reviewing the 2018 schedule on our conference web page. The final word of thanks goes to our 2018 OSGi Community Event Sponsors, whose support helps ensure the conference can take place. This year Bosch and IBM were Dual Elite (OSGi and EclipseCon) sponsors and Liferay was an OSGi Conference sponsor. 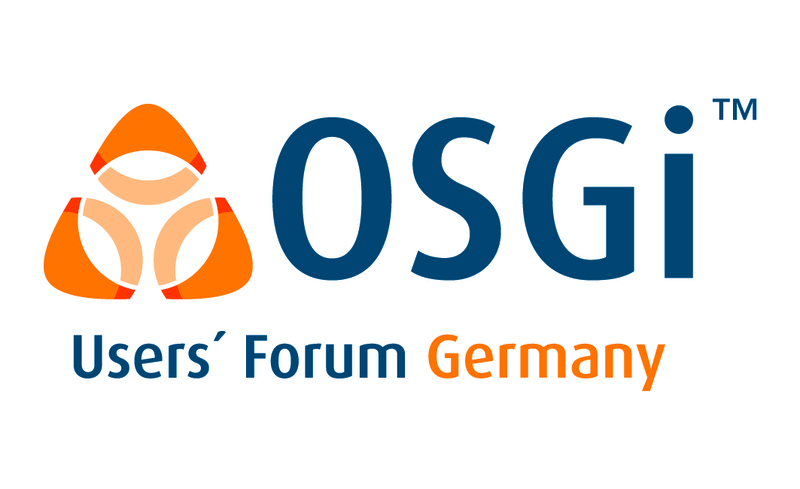 The OSGi Users' Forum Germany are having their next meeting the afternoon before the OSGi Community Event in Ludwigsburg - Oct 22 from 14.00hrs. This meeting will be a workshop focusing on the recent OSGi Release 7 and there are three talks which will include a review on whats new in Release 7, the updated OSGi enRoute for R7 and an intro to gecko.io. In addition there will be a Q&A and discussion session. The full agenda is available here. So if you are joining us for the OSGi Community Event or attending EclipseCon Europe this provides a perfect opportunity to learn more about the latest OSGi release. The meeting is open to all - OSGi Users' Forum Germany members and non-members and is being hosted as part of the Eclipse Community Day which takes place all day on Monday Oct 22. Its €60 per person to attend and this provides you with access to any of the sessions all day, lunch and refreshments at breaks. To secure your place please visit https://www.eclipsecon.org/europe2018/registration#special. If you haven's got your pass for OSGi Community Event and EclipseCon there is still time to get one of these too. We have a packed conference and would be great to see you there. So it's reaching that time of year again. Not only is it, gulp, only 91 days to the end of the year and a mere, double gulp, 84 sleeps until Christmas, October is a really big month in the OSGi schedule. Today, being October 1, means we are just 22 sleeps until OSGi Community Event 2018.
an exciting keynote from the European Space Agency (ESA) - "Flying to Jupiter with OSGi"
a tutorial giving some hands-on insights on how to go "From Zero to a Professional OSGi Project in Minutes"
And if all that OSGi goodness isn't enough, we are co-located with EclipseCon Europe again this year and attendees get full access to the EclipseCon schedule and exhibition, along with all the excellent social events. Registration is still open, so if you haven't booked your ticket yet I encourage you to do so fast and to secure your hotel as rooms are selling out. Big thanks go to the following companies who have sponsored the OSGi Community Event in 2018. It is their support that makes it possible for us to bring this event to you. See you in Ludwigsburg soon. 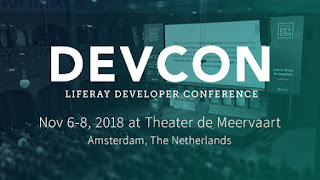 The OSGi Alliance is pleased to be attending Liferay DEVCON in Amsterdam in November. The main conference is taking place November 7 and 8 and we will have an OSGi booth in the exhibition area. 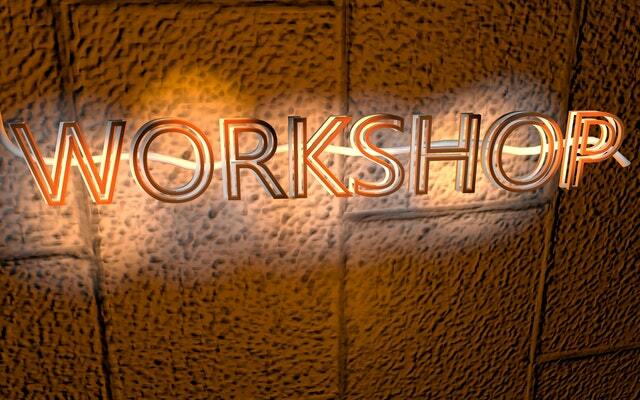 There is also an unconference taking place the day before the main conference on November 6. We are happy to answer any questions you have about modularity and OSGi technology, the OSGi Alliance, the new R7 release and anything else you can think of that is OSGi related. We would also encourage anyone who might be interested in joining the OSGi Alliance and contributing to the ongoing evolution and development of the open standard OSGi specifications to come and chat with us at our booth. Even though R7 is only just out the door, we are already drawing up ideas for Release 8 (R8) and so now is a great time to join us and get involved in the new activities. Liferay is an extensive user of OSGi technology and we are really pleased to have the opportunity to meet their community of users and developers at this key event. Ray Augé, a Senior Software Architect at Liferay, and co-chair of the OSGi Enterprise Expert Group, will be presenting on the upcoming OSGi CDI integration specification. Ray's talk will demonstrate common usage patterns and its component model that brings OSGi dynamics; like services and configuration, to CDI and provides for an ecosystem of CDI portable extensions. 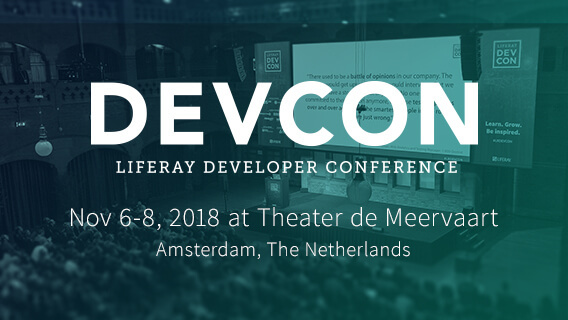 You can find out more about this year's Liferay DEVCON including how to register on the conference website. We realize that this is coming hot on the heels of the OSGi Community Event and EclipseCon Europe in October and Liferay is offering a 25% discount on DEVCON ticket prices to anyone that is attending that event this year too. 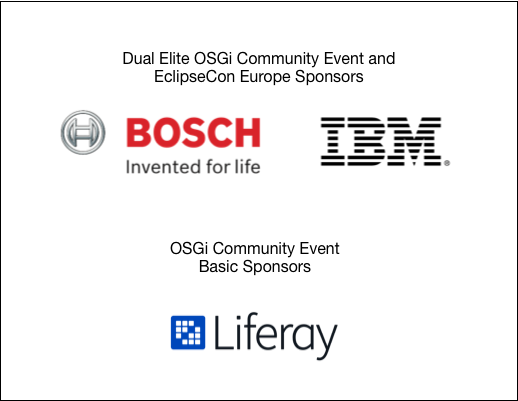 To obtain your discount code please see the Liferay advert in the OSGi Community Event and EclipseCon Europe event brochure. The OSGi R7 Highlights blog series has come to a close and we certainly want to thank you for following the series and hope you found it insightful and useful! The series featured posts from technical experts at the OSGi Alliance sharing some of the key highlights of the new R7 release. Its worth noting that the OSGi Core specification has provided a stable platform for developing modular Java applications for almost two decades. The OSGi Core R7 specification continues this tradition by providing updates to the OSGi Core specification which are fully compatible with previous versions of the OSGi Core specification. This gives developers and users of OSGi technology an established track record of certainty of their investment protection from adopting OSGi. The blog posts covered the topics below so if you missed reading any of the posts, be sure to take a moment to check them out. Feel free to send questions regarding any of the OSGi R7 blog posts to us by email or as comments on the post in question. We welcome any and all feedback and want to hear from you if you have any suggestions on future topics related to OSGi R7 or otherwise. Java 9 Support – Multi-release JAR support and runtime discovery of the packages provided by the JPMS modules loaded by the platform. Declarative Services – Constructor injection and component property types. JAX-RS – A whiteboard model for building JAX-RS microservices. Converter – A package for object type conversion. Cluster Information – Support for using OSGi frameworks in clustered environments. Transaction Control – An OSGi model for transaction life cycle management. Http Whiteboard – Updates to the Http Whiteboard model. Push Streams and Promises – The Promises packages is updated with new methods and an improved implementation and the new Push Streams package provides a stream programming model for asynchronously arriving events. Configurator and Configuration Admin – Configuration Admin is updated to support the new Configurator specification for delivering configuration data in bundles. LogService – A new logging API is added which supports logging levels and dynamic logging administration and a new Push Stream-based means of receiving log entries is also added. Bundle Annotations – Annotations that allow the developer to inform tooling on how to build bundles. CDI – Context and Dependency Injection support for OSGi developers. Be sure to follow us on Twitter or LinkedIn or subscribe to our Blog feed.